I just returned from thirteen days of heaven on earth a.k.a. camping at North of Highland Campground in North Truro, MA (near the tip of Cape Cod). One of the things I most love about camping is the lack of interruptions and distractions. Life is distilled down to basics — and things like TV and America’s Got Talent and Netflix and Orange Is the New Black simply disappear from one’s awareness. I did not speak with anyone via the telephone. There was no internet tempting me to visit Facebook or Linked In. I had no emails reminding me each day about a deeply discouraging array of horrible things happening all over planet earth which I could possibly help by signing a petition and/or donating money. I listened to no radio. I read very few magazines (mostly back issues of The New Yorker). I received no snail mail full of solicitations from environmental defense organizations and prograssive lobbying groups and hard-working political candidates. Instead I savored the rain and the sun. And wind in the pine trees overhead. And random sounds of fellow campers in the distance — sometimes the beep of a car with keys left in the ignition, sometimes the cry of a small child having an emotional melt down. 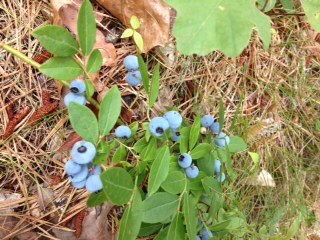 This year we arrived at the peak of blueberry abundance. Little scrubby bushes which in past summers might have offered a few berries were now covered with them. 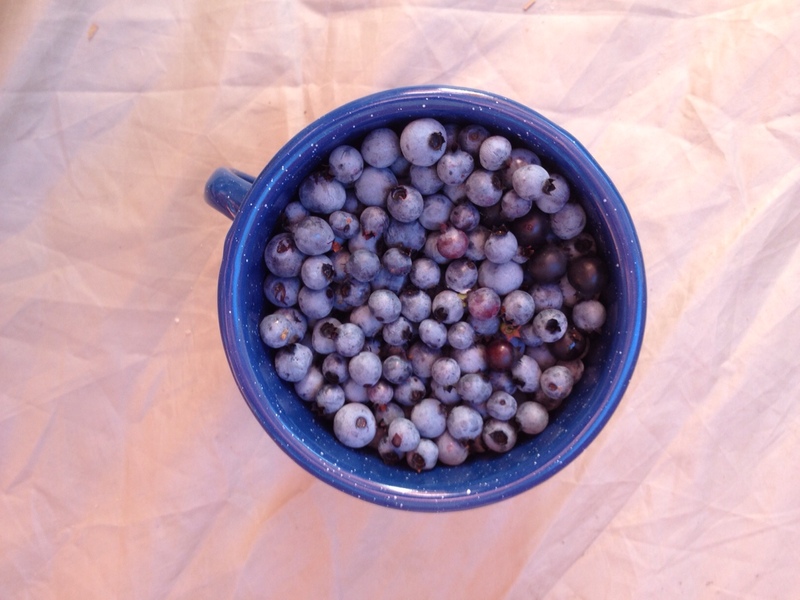 Each morning before the sun became too hot, I picked a mug-full to eat — first with oatmeal and then as an anti-oxidant treat throughout the rest of the day. Some bushes had small berries, and others were loaded with whoppers. On the morning of our departure, I picked one final mug’s worth to bring home to Arlington, and I am eating the last of them as I type this entry. At first I was concerned that I might be depriving the local wild life of much-needed sustenance. One morning I watched a small red squirrel pick blueberries, climb up on a small tree stump to eat them, climb down to pick more, climb back up to eat more until she or he apparently had eaten their fill and frisked off into the trees. But that was the only animal consumption I witnessed. And I saw many wrinkled, older berries on the ground under the bushes — so plenty of them were ripening and falling to the ground untouched by anyone. I decided it was OK to revel in this unexpected, beautiful, delicious gift from mother earth. Maybe the two wild turkeys we saw as we were packing up camp would return to savor them? This morning I was given a link to a slide show that a father had put together to play at the memorial service for his four-year-old son, who had died as a result of complications after an unsuccessful heart transplant operation. This radiant little being was a student of a fellow Music Together (MT) teacher, and she had reached out via Facebook to a bunch of MT teachers when he was about to go into surgery so that we might pray for him and his family and his caregivers. Despite the massive amounts of time Aiden had spent in hospitals during his short, sweet life, he was able to stomp in rain puddles and play at the beach and attend Music Together classes with his parents. Apparently he loved singing and dancing — and his parents included several MT songs as part of his slide show and memorial service. From the slide show I could see how loved he was by his extended family. And as a result of watching it, I brought an aching awareness of love and loss with me to my Music Together class this morning — and did my best to welcome and celebrate each being who came though the door. The song at the beginning of this post was written by Lynn Ahrens and Stephen Flaherty for a musical called A Man Of No Importance. I recorded it with Doug Hammer playing piano and Mike Callahan playing horn several years ago as part of my “Will Loves Steve” show — which featured songs written or co-written by people named Steve or Stephen or Stevie. For me it captures some of the poignance of being a loving human here on planet earth. After I take a shower in the morning, I like to wipe the water off the tile walls with a squeegee. I had never done this until I visited my friend Michael Ricca’s family home in Quincy, MA. Their bathroom was spotless, and I learned that Michael’s dad always cleaned the water from the shower walls with a squeegee. So now I think about Michael and his parents almost every morning as I stand — naked or wearing a towel — and use my shower squeegee. Michael’s parents used to invite me and him and Nina Vansuch and Brian Patton over for huge Italian feasts when the four of us were singing together in a musical project called At The Movies. So I also think about Nina and Brian and the music we made together each morning as I wipe water from the shower walls. I love how “squeegee” and “Michael Ricca’s dad and mom” and “Michael Ricca” and “Nina Vansuch” and “Brian Patton” and “Quincy, MA” are all neuronally linked in my memory banks. And somehow the act of wiping down the shower walls brings all of them to the surface of my consciousness. Brian and Nina and Michael and I performed together for a few years, selling out Scullers Jazz Club on a regular basis and recording a CD, Reel One, which still — ten years later — sounds great. I have included a couple of selections from Reel One in this blog. And a couple more (“Wives & Lovers/Coming Around Again” and “That’ll Do”) are in the player in the right hand side bar of this page. I especially love Nina’s vocal performance on “Theme from The Valley Of the Dolls” and the vocal harmonies Brian crafted for us to support her. I don’t know if At The Movies will ever perform together or record again, but I am very grateful that we have such lovely audio documentation of our time together. I was talking with a fellow singer about the fascinating power of neuronal associations the other night as we drove home from an open mic in Natick. Sometimes what transforms someone’s song interpretation from good to great is simply how many neural associations they have woven into their memorization of the lyrics. A song may remind them of a loved one who once sang it to them, or an intense crush they once had in high school, or a particularly tumultuous (or poignant or peaceful) period in their life. Or all of the above. And those images, those memories, those associations somehow bring the song to life when they perform it. I try to inoculate songs that I am learning with as many different layers of memory associations as I can muster. Then when I am performing, I can tap into different constellations of memory associations as the spirit moves me. One night a song about love might evoke a strong image of my nephews and niece. On another night I might find myself remembering my former voice teachers — or the first person with whom I fell head over heels in love — or my sweetheart of 22 years — or one of my siblings — or the horse our family owned as a pet for over 30 years — or the corgi we had who once raised a litter of abandoned kittens — or the heron who sleeps at night on an abandoned shopping cart in the middle of a stream which runs along a busy road near my house. Or huge Italian feasts with Michael and Brian and Nina and Michael’s parents at his childhood home in Quincy. Or squeegeeing my shower tiles. One of the truly magical aspects of a musical life on planet earth in the 21st century is how widely one can share one’s songs if one has access to the internet. After Bobbi Carrey, Doug Hammer and I — with lots of help from Mike Callahan, Jonathan Wyner, and guest musicians — recorded our CD “If I Loved You,” we heard from family, friends AND folks whom we had never met. One listener included our version of the David Friedman ballad “I’ll Be Here With You” (which you can hear by clicking on the right hand sidebar of this page) on a CD she sent to her fiance who was serving in the US military overseas. Another fan — who had been given our CD by a friend — tracked us down and told us that she listened to our music each morning while she worked out. When her husband died, she asked us to sing at his memorial service. And I recently learned — in a reply to my blog post about music and spontaneity — that a CD of my “Will Loves Steve” show (which features songs written by people named Stephen, Steven or Steve) had traveled from Massachusetts to Argentina, where it helped lift the spirits of someone who was feeling very low. The pianist is Doug Hammer, and the horn player is Mike Callahan. I am curious to see how my musical endeavors may continue to ripple around the planet thanks to the internet. Do I Love You, Do I? Can We Slow It Down? A Kind and Steady Heart! When Did Snowflakes Fall So Sweet?